Sarah started playing hockey (Minkey) at the age of 4 for United Hockey Club. 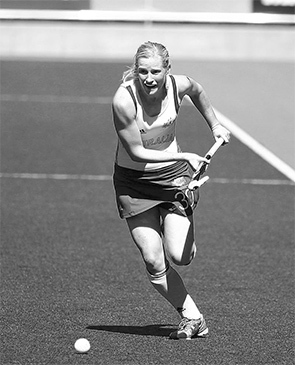 Sarah commenced her representative career in 1996 when she was selected to play in the ACT U/16 School Girls Hockey team. She then progressed through the ranks of U/18 and U/ 21 levels to make her debut in the Senior’s in 1998 when she was selected to play for the Canberra Strikers. In 2002 Sarah was selected in the Manchester Commonwealth Games team, but had to withdraw through injury. In 2004 Sarah was selected in the team for the Athens Olympic Games, but was forced to withdraw one week out from the Olympics due to an injury she sustained in a pre-Olympic tournament in Spain. She worked hard over the next four years and was selected in the team for the Beijing Olympic Games in 2008 where Australia came 5th. Sarah played 173 games for Australia scoring 25 goals.